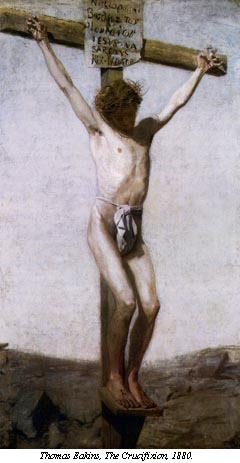 The Crucifixion (painting: Thomas Eakins, 1880). This is final part of a 3 part series on Jesus and the places of pain. The first comment is that the physical pain of the crucifixion was not unique to Jesus. (Take time to read the JAMA--Journal of the American Medical Association article. It is incredibly informative.) The day he died, two other "bandits" were crucified as well on each side of Jesus. Rome was notorious for crucifying thousands who were considered traitorous or a threat. There are many who believe and teach that God the Father cannot experience pain. God cannot "experience" anything...especially anything emotional. God is without feeling. This is the doctrine of impassibility (apatheia). Love is not a feeling in God, neither is joy nor grief nor anger. Impassibility is a subset of immutability which teaches that God cannot change. Feelings are so fickle and the last thing God is subject to is wavering feelings. God is a divine Dr. Spock. Now, Jesus is just the opposite. He draws the short straw in the Trinity, so to speak, and enters incarnationally into the vexing universe of fluctuating human feeling. Because he is God and human, Jesus can feel everything we feel. With the 1946 landmark book by Japanese theologian Kazoh Kitamori, A Theology of the Pain of God, in the background, I would suggest (on biblical grounds) that God the Father, Son, and Spirit are capable of feeling. Those who advocate the unfeeling God have "discovered" in the Bible "anthropomorphisms," that is, terms ascribing human characteristics like icky emotions to the unfeeling God. I believe that the terms in the Bible authentically reveal aspects of the Being of God. The primary biblical revelation is that God is love. One view "explains away" these terms. The other takes them at face value. Kitamori presents a God who experiences divine pain because He is a God who loves. At the cross when the infinite love of the Father meets the just wrath of the Father, God experiences a pain unique to God. Yet it is this pain that enables God (Father, Son, and Spirit) to "feel" the whole scope and depth of human pain. I don't want to go beyond Scripture, but does Jesus truly feel the sexual violation of a young woman by a gang of thugs? Where is God? Is He there? Does God feel the terror of a child beaten willy-nilly by a drunken parent? Where is God? In Rwanda church leaders and their people are hacked to death with machetes? Where is God? Does He feel the pain, the horror, the utter inhumanity? The scenarios are endless. The cross for Jesus was the wholesale violation of an unblemished human being--body, soul, mind and spirit. Yes, Jesus agonized physically and his blood drained out of him. He also cried as they bitterly mocked, verbally abused, and taunted him. Jesus was deeply shamed and socially stygmatized. Out of modesty most crucifixion paintings have Jesus' loins covered. Yet, he died naked, exposed to the passers-by. Infinite indignity. When Jesus advocates for me and you and for the oppressed of the world, the last thing I want the Father to say to the Son is, "I really don't know what you're talking about." Thanks so much. An enriching post, and depths to ponder here. Surely we can sense more than just words in God's speech in Scripture, and ultimately so in his final word Jesus. And surely this is to go on through his body, us, today, to the world. I know we're in the realm of mystery, but there's a lot being said about what God *feels* and I'm trying to engage that conversation. Wow, this is a lot to swallow, I think I will have to ruminate on this awhile. I have always taken for granted that God "feels", ever since I was very young. That there are those who believe He doesn't is a new thing to me. But wait is that why a pastor would teach that when the Lord looks at us He doesn't feel emotion, say like you did when you viewed your new granddaughter, He simply sees a sinner who needs fixing? No emotion attachment, just another job that needed doing? I don't as a rule respond to anonymous comments, but you seem truly interested. Here's the thinking: God is perfect, therefore he cannot change. If he changes, then either he becomes less perfect and not God or he was imperfect to begin with and not God. We know that emotions represent change and since God cannot change, he has no emotions (this is impassibility). He is in this view, as Dallas Willard writes, "the cosmic unblinking stare." Yikes John...is this really the way it goes? "We know that emotions represent change" ?